Renovations without the frustrations. It’s possible, believe it or not! It’s easy for home renovation projects to get out of hand and become a major hassle—but you can skip the issues and extra work and still transform your home in no time, simply by giving your staircase a new look! Your home’s staircase is often the first thing guests see when they come into your house and it can have a big impact on determining the look and feel of the entire space. An open floor plan is the ideal home setup now for homebuyers and owners alike, great for making spaces feel larger and more modern. However, if you have one of the many with homes built with one or several staircases that interfere with open up sightlines — we have your solution! Don’t live with outdated balusters, broken wooden spindles or a staircase that doesn’t match your individual style. Iron balusters add flair and feature designs that complement every type of home, from farm houses to contemporary looking spaces. Compared to bulky balusters that block light and separate rooms, the slim and sleek designs of iron balusters make your home feel larger and more open. Plus, they are built to last and offer the strength you need to keep staircases safe and durable. Get started by choosing from Carolina Stair Supply’s expansive selection of iron baluster designs and unique collections for a design that matches your home’s style. Try out the StairArtist tool for assistance with choosing the perfect iron baluster for your space and create the design of your dream staircase. There’s no reason to hire a professional for every project in your home, and that goes with your staircase, too! With traditional iron baluster systems, power tools are required for installation. They require drilling round holes for square balusters, the separate installation of footers, and more time-consuming steps in between. This process is not only arduous, it can get expensive if you aren’t comfortable doing the project yourself and have to hire professional contractors. Instead of the hassle, pair your beautiful new iron balusters in Step 1 with Carolina Stair Supply’s Rail Zip Clip™ Installation system. The simple staircase system you need, learn more about how anyone can install attractive iron balusters, 100% unassisted, and find out where you can buy the Rail Zip Clip! Once you have selected your stylish new iron balusters and learned about how the Rail Zip Clip installation system will save you time and hassle, you’re ready for installation! For use with any standard ½ inch iron baluster, Rail Zip Clip installation is simple. Simply screw the Top Clip Bracket and Bottom Bracket into your existing balustrade and then slide the iron balusters in place onto these brackets—no drilling necessary! This installation system means you can stain and finish your stair rail, treads and newel posts before going back and attaching your iron balusters. With an attached top cover and base, after your balusters are in place you simply slide down these footers and secure to complete your new staircase look! 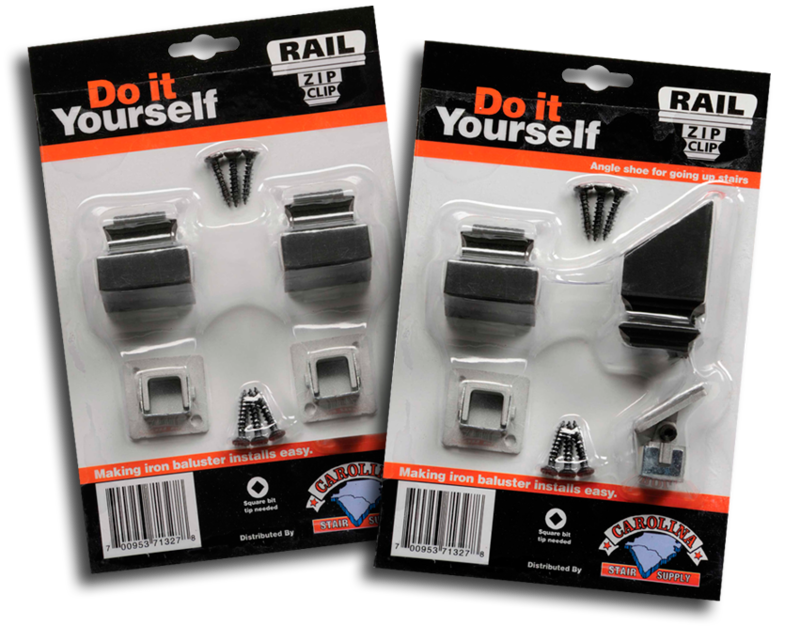 Learn more about the Rail Zip Clip system, then order online to begin the first step in transforming your existing staircase.